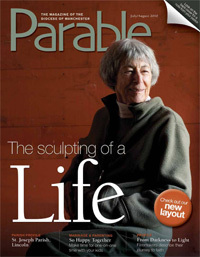 Stained Glass Artist Sylvia Nicolas is in the news these days with a magazine cover story called The Sculpting of a Life, in the Parable Magazine, a magazine of the Diocese of Manchester, New Hampshire. Providence College called The World of Sylvia Nicolas - Painting, Sculpture, Stained Glass. The exhibition runs September 8th through October 22nd, 2010.